Minister for Pacific Peoples Aupito Tofae Su'a William Sio, standing, third from right, at Link House for the first of a series of nationwide meetings. A packed hall at Link House in Hamilton turned on Pacific colour, music and dance as the Ministry for Pacific Peoples began a series of nationwide meetings in the next stage of consultation before reporting to Government. The Minister, Aupito Tofae Su’a William Sio, said Pacific peoples are already contributing $8 billion to the New Zealand economy, despite facing barriers in health, education and housing, and that the challenge is to eliminate those barriers. A key outcome for the meetings is to establish a strategic direction so that the Ministry, in collaboration with regional providers, unlocks opportunities and provides support to develop Pacific peoples’ contribution to the country’s future growth and prosperity. Waikato was the first of nine regions to host the Minister as his Ministry reported back on Pacific Aotearoa Lalanga Fou, a vision for Pacific development that came out of extensive consultation last year. Ane Takapu, right, was helped into work by Tania Hansen and her team from InWork. 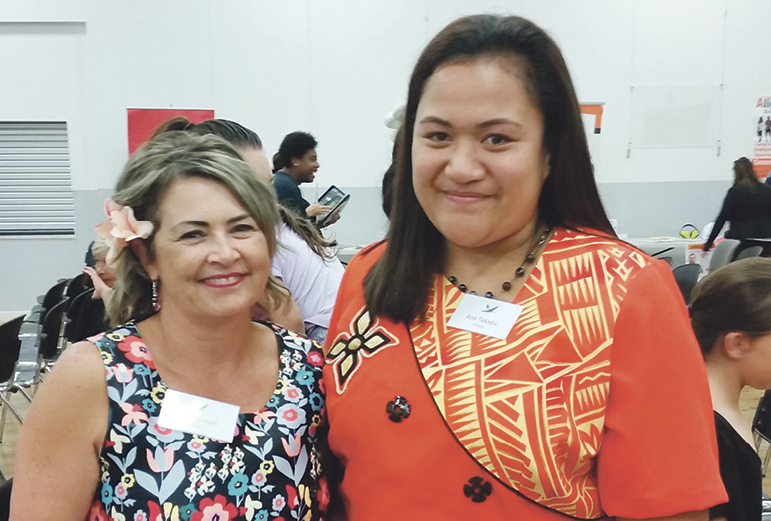 Ane spoke at the Lalanga Fou fono about her journey. Many Pacific communities were represented at the Lalanga Fou Fono – Tuli Takes Flight event on March 22, and the evening featured music and dance from local group Talents of the Pacific Academy, including massed ranks of Hamilton school children. Aupito William Sio said in his speech that during consultation last year he had deliberately spoken widely with young Pacific people. “I wanted to capture the dreams and aspirations of our young people because they are the future of Aotearoa New Zealand. We have one of the youngest populations, [and]fastest growing,” he told the audience. He said more than 63 percent of New Zealand’s Pacific population were born in the country, and that they had told him their language, culture and spirituality were important to them. Resilience and health have also been identified as a Pacific Aotearoa goal. He said economic development was a key factor in young people’s general wellbeing, and that many of those he had spoken to were running their own small businesses and creating opportunities. “The final key goal from that conversation was the identification that our young people are resilient and they want to be prosperous. The Ministry asked Treasury to scope the contribution of Pacific peoples to the New Zealand economy. Its report, released last year, identified they contributed $8 billion dollars to New Zealand’s economy, with 1500 employers, and 27,000 voluntary hours weekly. “Here’s the interesting thing: that’s a contribution despite the challenges that we face in housing, in health, in education,” Aupito William Sio said. He also told his audience that Shane Jones had agreed to contribute $8.85 million from the Provincial Growth Fund over the next two years towards a regional rollout of Pacific Employment Support Services, an Auckland-based programme helping young Pacific people into education, training and employment. “It’s a model that we’ve evaluated and tested, and for every dollar the Government puts in there is a return of almost $11 back to the community,” he said. Waikato Pacific Business Network chair Meleane Burgess, who gave two workshops at the event, says almost 60 businesses in Hamilton alone are owned by Pacific Island people, while the 2013 census identified that the Pacific population in Waikato is 17,300, a number expected to have doubled by 2018. She said the success of the event, drawing such a large crowd, showed how much hunger there is in the region for support. Burgess said the evening was also successful for her organisation, which presented two workshops, the second one to a full room, with many of the participants indicating interest in joining the network. Other organisations to give workshops were K’aute Pasifika Trust, Talents of the Pacific Academy (TOPA), InWork NZ, Vertical Horizonz and South Waikato Pacific Islands Community Services Trust.